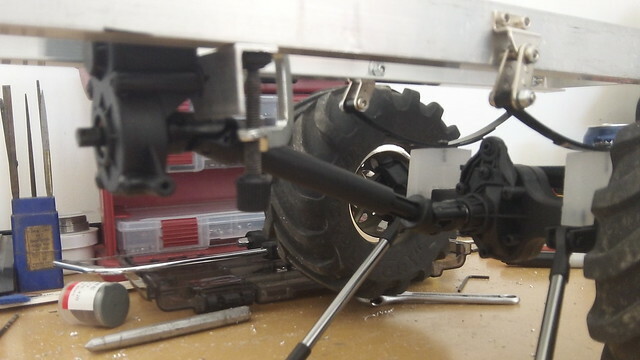 Test fit the steering servo and the Traxxas transmission. I want to keep the motors up front so they get plenty of air. 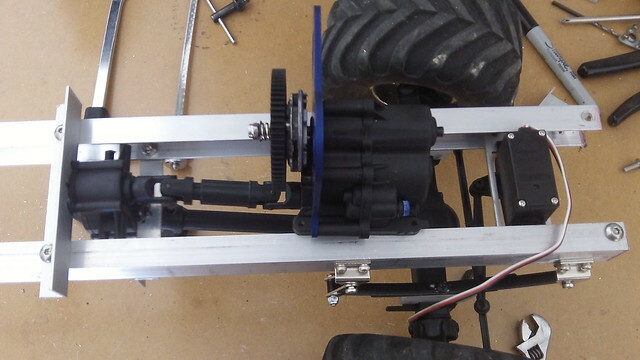 Test fit the transmissions, will have good ground clearance and shallow drive shaft angles. Last edited by bluedually : 08-12-2018 at 02:31 PM. nice you staying with leaf springs up front and coilovers in back or is rear getting the leaf spring treatment too? 4 link and coils in the rear... Its sort of scale since they are leaf up front and air ride out back, at least the few I have seen. 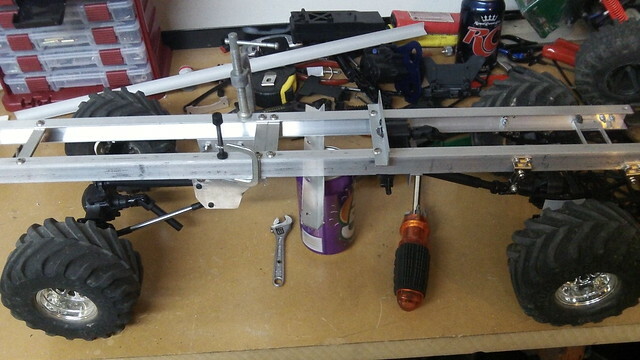 Got started on the sub frame for the HPI trans and what the rear axle links will mount up too. Also left some material in front of the trans incase I switch to 4 link in the front or need to run traction bars to keep axle wrap under control. 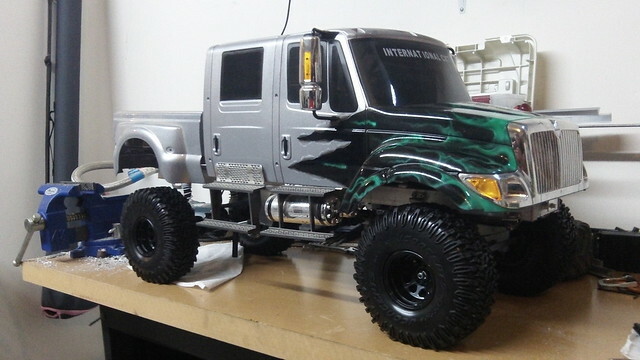 Got the HPI trans mounted up. With the long drive shaft I could tuck it up in the frame a little better. Built the sub frame for the rear 4 link. Haven't bolted it in yet as I need to get the body mounted so I can set the wheel base. Hoping to get it sitting on springs at all 4 corners this weekend. Last edited by bluedually : 08-12-2018 at 02:32 PM. Tinkered with some body mounts, they need more tinkering. Did figure out a solution for the much needed carrier bearing. 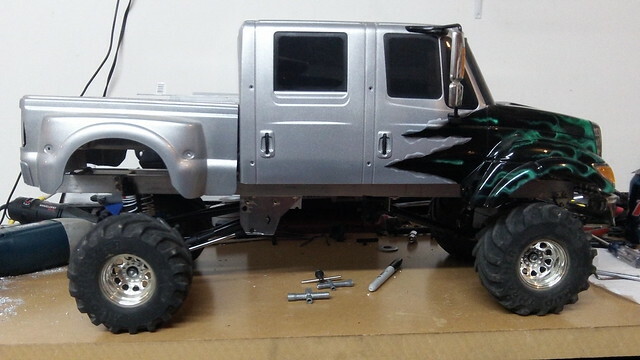 This thing is so long, it will have to have 2 rear drive shafts. Just need to fab up something to keep the steering knuckle turned carrier bearing from pivoting and it will be good to go. 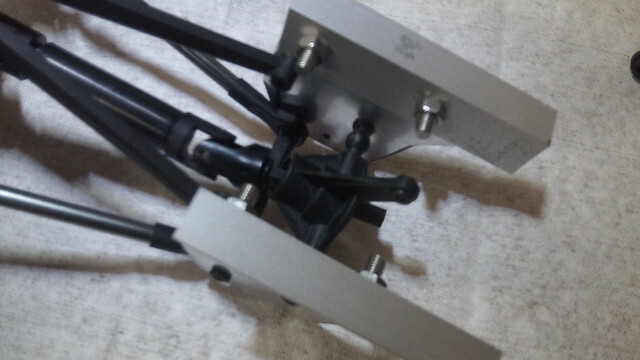 First plan for the traxxas transmission mounts wasn't going to work, but figured out something different. Its getting closer to being a roller. Rear cab mount done and rear axle and 4 link bolted to the frame. Those 5 inch tires look kinda small lol. Suspension complete!!!! The truck has springs at all four corners. Last edited by bluedually : 08-12-2018 at 02:33 PM. Cab mounted and a cutting board electronics tray done. 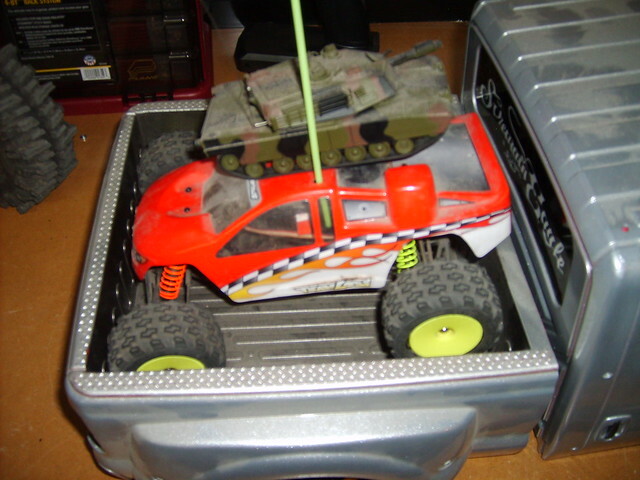 And a Losi Mini T the CXT bed, just cause. Last edited by bluedually : 08-12-2018 at 02:38 PM. Tires and wheels showed up. 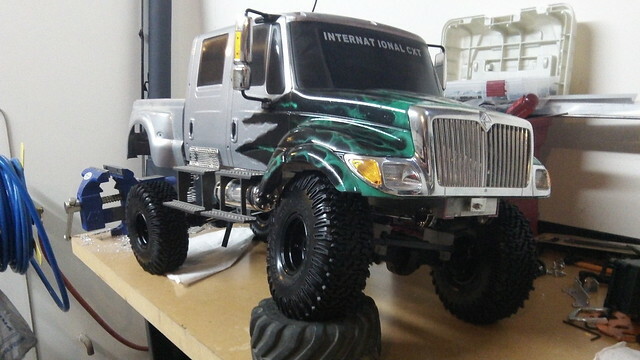 I dig the black HPI WheelyKing rims... but I had ordered them for the crawler/basher. So the tires aren't glued. 5.98" tall 2.2 JConcepts Scorpios, the right: height, width, tread pattern that I have been looking for. I am freakin stoked. Last edited by bluedually : 08-12-2018 at 02:40 PM.